Buying the right paint for a project can be confusing. Luckily, it is relatively easy to paint both plastic and metal with the same paint. Some paints have difficulty sticking to different surfaces, like metal, wood, or plastic, but there is an equalizer: paint primer. Using primer will prevent chipping, peeling or cracking, which could ruin your do-it-yourself project. Depending on the size and scope of your project, you can use either spray primer or primer paint in a bucket. Clean the metal and plastic with soap and water. Wait for it to dry. Check the area for any debris or dust which may cloud the detail of the metal or plastic. Spray paint the primer on if your project is small and detailed—one coat is enough. 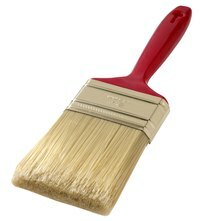 Hold the spray can 12 inches away from what you are painting and sweep the can back and forth across the surface, spraying evenly along the surface until there is an even coat. Paint on the primer with a brush if the project is large and relatively straight-forward in design. It may take two or three coats until there is a solid coat of primer paint. Brush the paint on or use a roller if the space is big enough. Avoid clumping paint as much as possible--many thin coats of primer are better than one thick, clumpy coat. Apply the paint of your choice to both areas—the primer acts as a common ground (much like a canvas) that bonds whichever paint you choose for your project to both the metal and plastic. The different types of primers include oil, latex, and shellac-based formulas. Oil-based is used for wood. Latex-based is used for drywall, soft woods, concrete, and metal. Shellac-based is used for metal, plastic, plaster, and wood. For the purposes of metal and plastic projects, use shellac. Always prime in a ventilated area or outside. If you open the doors, windows, and have fans blowing to ventilate the area and that still isn't enough, wear a respirator or a mask.